the above picture shows the children in traditional dress for the school closing ceremony. “For the past 2 days, we have had no food; nothing to feed the children”. This was said by one parent as we hand out the food to the community. This is the 4th year that sponsors of children at the school have contributed to an annual food parcel for the children’s parents. For most, the food is essential. It’s been a long drought since the last rains in May. For the past 2 weeks it has been raining again, the grass is regrowing, the animals are returning to the area and families will soon be able to have milk from their cattle and goats. It’s the end of the school year and the start of the 6 week school holidays. Many of the children will return to school in January much thinner having missed their daily school lunch. 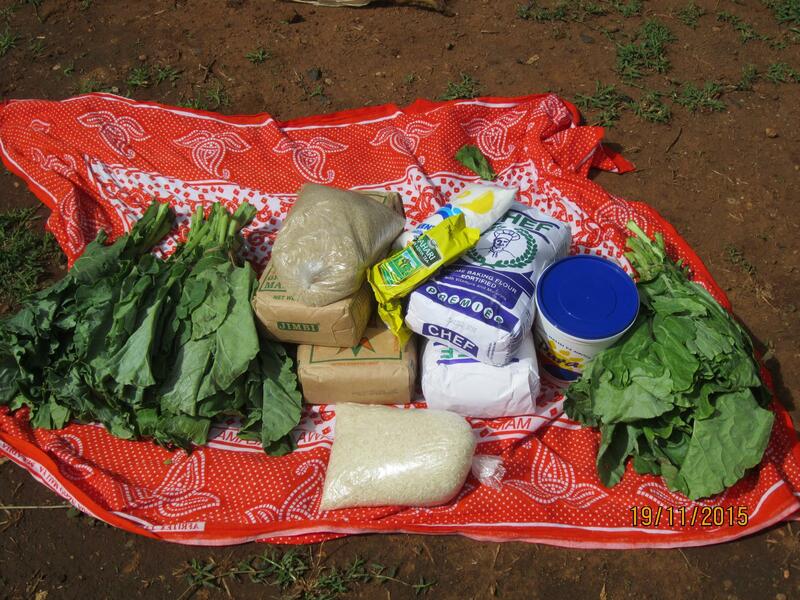 Food parcel for the parents. Long term, we want all mothers to be able to grow food for their family. This way, when the fathers are away with their cattle, the children will still be fed. In a place that has long periods of drought, this means having access to water. After the failure to drill for water mentioned in the last newsletter, we are pleased to report that the latest drilling has found a lot of water. 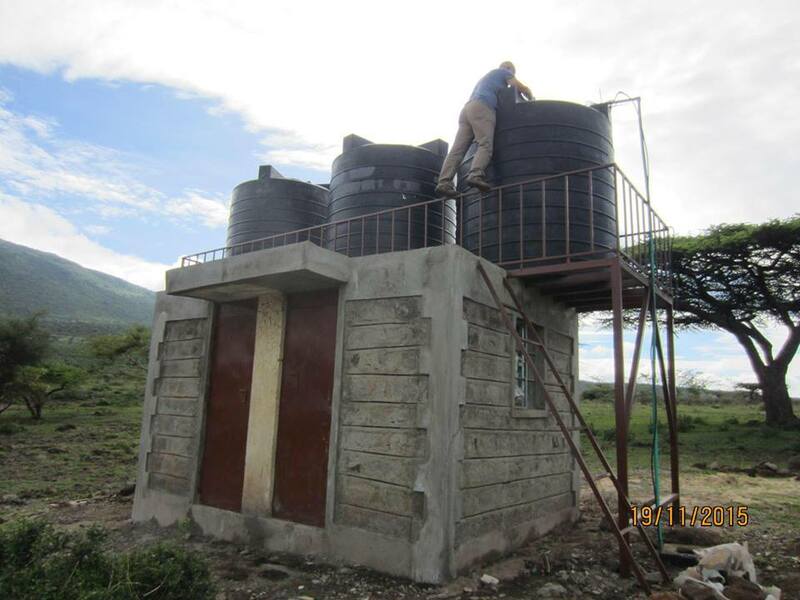 This new bore-hole has been fitted with a solar powered pump and large storage tanks. In the next few weeks, one acre of fertile land will be fenced ready for 80 families to each grow food on a plot 6m X 8m (26′ X 35′). It only took and afternoon to fill these 3 large tanks using the solar powered pump. Our hearts sink when the government water inspectors turn up at the bore hole. This usually means that they want bribes – something we do not pay. However these inspectors are Maasai so they are very happy that we are helping their people. Kenya is still very tribal. “My son is being circumcised but for my daughter, never”. The anti FGM meetings and message organised by the school earlier this year is getting through. 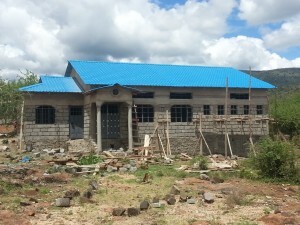 The school now has 157 children, soon to be 185 and around 160 sponsors supporting them. As the numbers increase, it is becoming difficult for Helen to give the sponsors all the feedback they deserve. 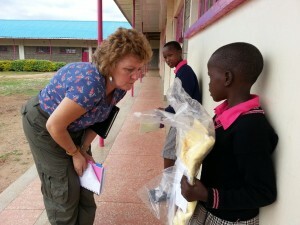 A sponsor, Tracey has agreed to help with 2 classes and she visited Olepolos to get to know the children and teachers. Maasailand is a special place, divided up now into small pieces for each family, the cattle, goats and sheep still roam looking for food like they have for thousands of years. Unfortunately the soil has eroded and is very rocky and years of drought have taken their toll. Every Maasai person I met was very warm and welcoming, it seems like a cliche to say it but they treat every child as their child; they scold them and care for them all. The majority of the community are very poor with some still living in traditional bomas made of cow dung and some living in tin huts. They are all very dark, hot and smoky. You can read a full report of Tracey’s visit here. The orphanage – November 2015. 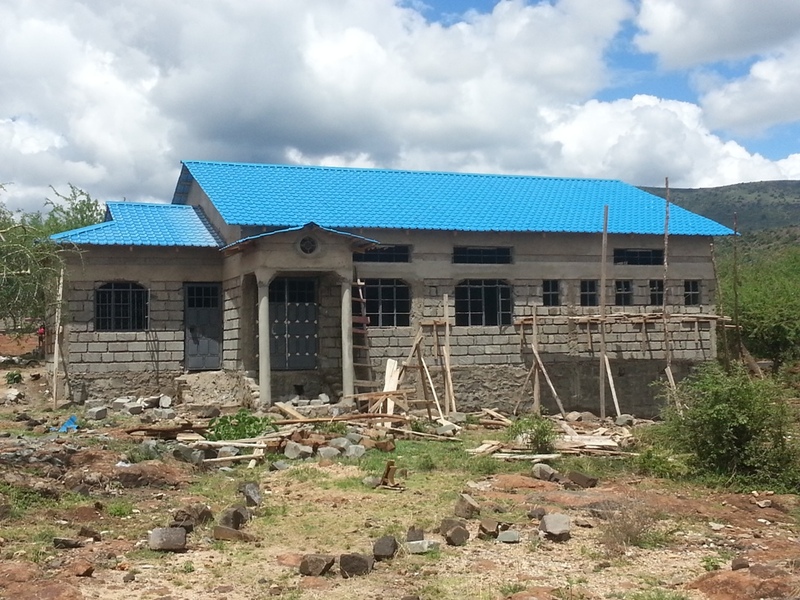 The construction of the orphanage is progressing well, hopefully ready for early next year. We will not be in a hurry to fill it with children. 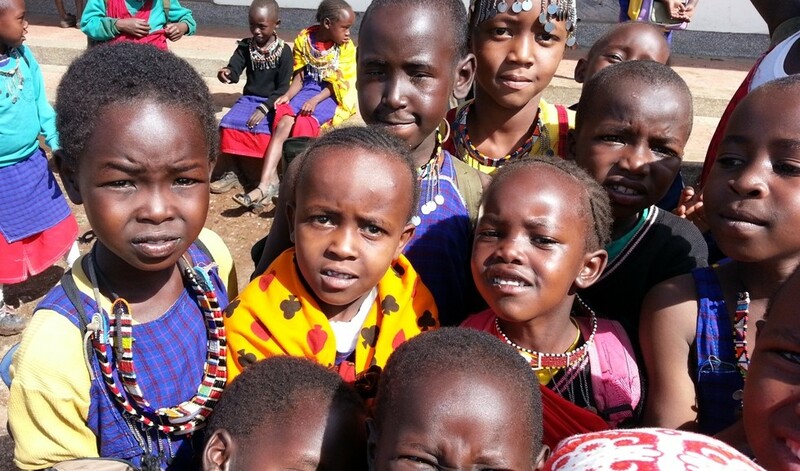 The Maasai look after orphaned children well and any child is better off with a family than in a home. However there are a few who have not settled well into their new families so they will live at school. Orphaned children need the very best education as they will have to fend for themselves far more than other children. 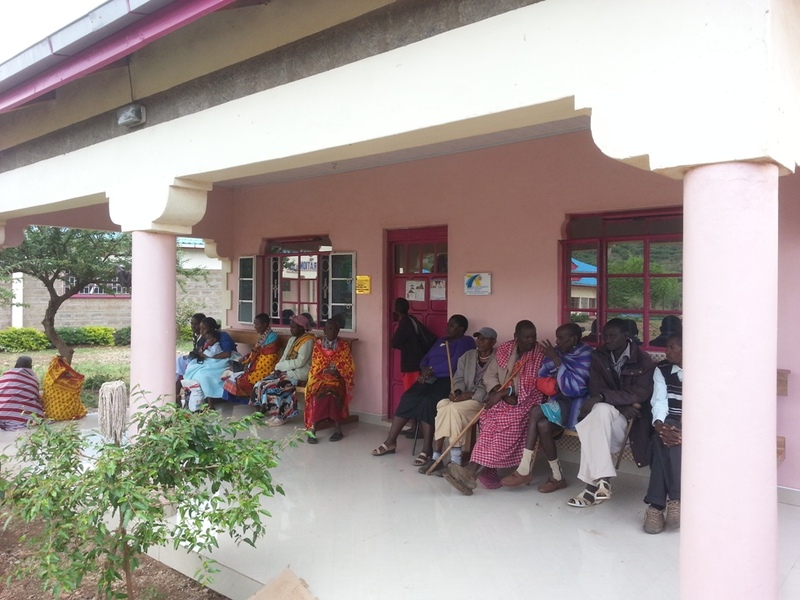 The clinic has a steady stream of patients but not as many as we would like. At 50 Ksh (about £0.35) per consultation it is still too expensive for many local people to afford. A UK doctor arrives for a visit so we offer a free consultation. Around 50-80 turn up because it is free – many with long term severe problems hoping that a UK doctor will have a miracle cure. Waiting to see a UK doctor. How many UK children want to come to school during the holidays? It is teacher interview time so we need 20 children to help us test the teaching ability of prospective teachers. Every child wants to come as they get a school lunch and they don’t have to fetch water (girls) or look after the goats (boys). It’s the end of school year closing ceremony. Most of the parents turn up to be entertained by the children and hear speeches by the governors. This video shows a dance by the eldest class. Like the last 3 years, we are fundraising again to build the next classroom. Donations received from the 6th – 12th December will be doubled by a kind donor. More information here. Thanks again to all the Charity supporters and sponsors. Together we are making a real difference to this community. Lovely to receive your news, what a brilliant project to support, well done. How wonderful to see and hear the children dancing, and so glad the rains have come. Well done for all your work out there…. what a difference this must make. I am so happy to support this charity, and so enjoy the newsletters. Well done to everyone who helps. Wonderful to read this and watch the dancing; to get a taste of what life is like for the Maasai. I feel humbled and grateful for what you all do. I enjoy being a small part of this work. Once again it is fantastic to receive news of the Osiligi community and the great work that the charity has undertaken. Sandra and I take great price in sponsoring a child through school, and are delighted not only with Christine’s progress, but also with receiving regular “school reports” and updates. Asante sana.